Create custom maps of the area you’re interested in and see how conditions could shift in the future, as a result of climate change. Ecoregions are large areas of land that contain common climatic features, including temperature, precipitation, and humidity. An ecoregion’s climate influences the type of vegetation, wildlife, and communities that live there. 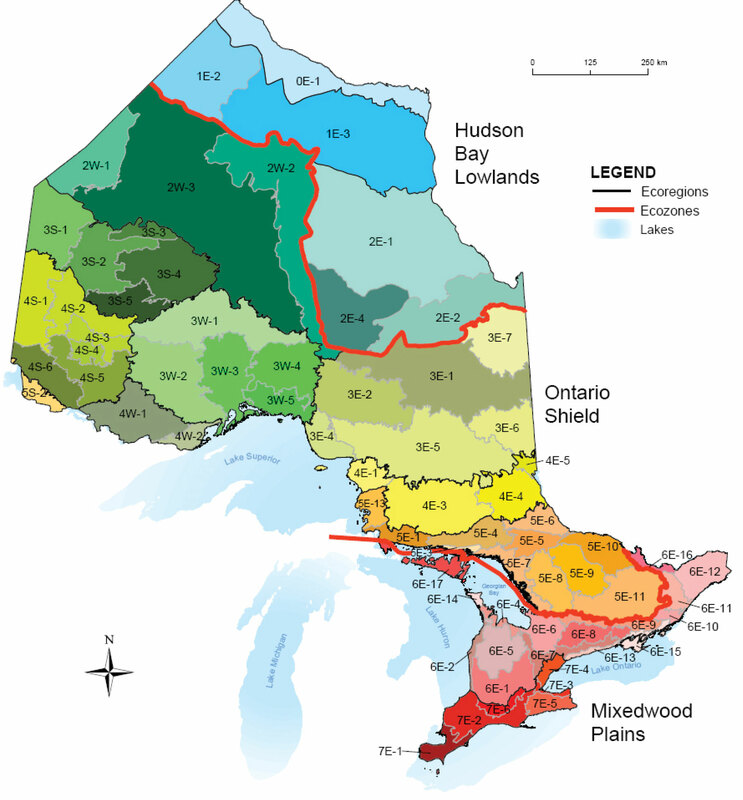 Ontario’s land is divided into 14 ecoregions, each with distinct ecosystems. Learn more about how Ontario’s ecosystems are classified. The Carolinian forests in southwestern Ontario are home to many species of plants and animals, including some endangered species. If the current climate conditions in this ecoregion (7E) move as predicted, the plants and animals there will have to adapt, move or die. Depending on the model and greenhouse gas scenario you choose, the current climate conditions for ecoregion 6E (includes Toronto, Barrie, Kingston and Ottawa) are predicted to shift to the Sudbury and Sault Ste. Marie areas within the next 50 years. Choose options from the drop-down menus to see data for today and the future. If a climate envelope is not shown it is because the 1971-2000 climatic conditions for this ecoregion are not projected to exist within the boundaries of jurisdictions shown on this map during this period in time. Climate information derived from spatial climate data provided by Natural Resources Canada, Canadian Forestry Service, Sault Ste. Marie. Published February, 2010, © 2010, Queen's Printer for Ontario. This map is a product of the Applied Research and Development Branch, Ontario Ministry of Natural Resources and the Canadian Forest Service. Produced By: The Provincial Geomatics Service Centre, PGSC Project ID: #8411. Projection: Lambert Conformal Conic. Datum: North American Datum 1983. This map is intended for the purposes of illustration and discussion only. It shows one of a range of possible future projections of Ontario's climate. Predictions of future climate may vary from those shown here due to uncertainty in the rate of global release of greenhouse gases due to human activity, unknown or inaccurately quantified feedback responses releasing/absorbing greenhouse gases from land and water ecosystems, and shortcomings associated with climate modelling. Do not rely on this map for legal administrative purposes. This map may contain cartographic errors or omissions.